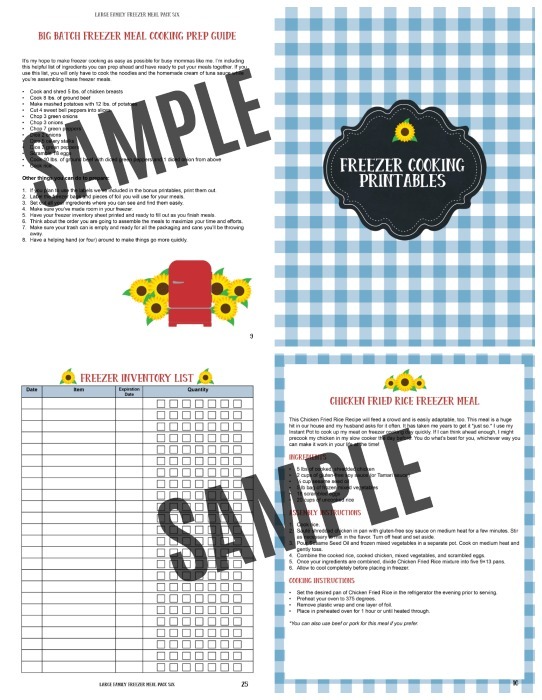 Whether you’re eating gluten-free because you’ve been diagnosed with a gluten allergy or intolerance or you’re eating gluten-free as part of a Paleo or Keto diet, this collection of large family gluten-free freezer meals will help you feed your family meals that YOU too can eat. From casseroles and stews to breakfast sandwiches and breads, you’re sure to find more than a few healthy gluten-free meals to serve your family! Many of these gluten-free recipes already have freezer meal directions or can easily be adapted to be freezer friendly. And when you’re grocery shopping for any of these recipes make sure you select gluten-free products. 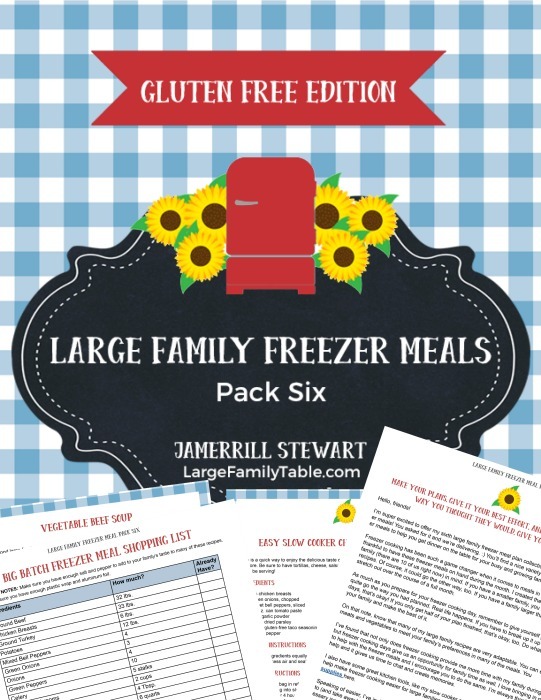 Don’t forget to check out the new large family gluten-free freezer meals pack in the limited time discounted large family freezer meals collection! My friend, Jo, makes an amazing Mexican Lasagna that’s gluten-free, easy to make, and oh so yummy! Slow Cooker Honey Pork Chops and Apples are perfect for autumn! It takes less than 10 minutes to throw this meal in your crock pot, and you’re all set! You can prep this Crockpot Chicken & Sweet Potato Stew ahead of time and pop it in the freezer. Just thaw it overnight, and toss it in the crockpot to cook all day. Double or triple this Chicken Taco Soup recipe to make enough to feed your large family. Eat it tonight or put it in the fridge for a busy night. You won’t believe what the secret ingredient is to bind these homemade gluten-free meatballs together! Chicken, Broccoli, and Bacon Casserole is easy to double, triple, or even quadruple so you have plenty of freezer meals when you need one! This quick and easy Freezer Burrito Casserole calls for just five ingredients, and it’s gluten-free! Add some Crockpot Lime Chicken to your monthly menu. Your family will love this naturally gluten-free meal. You can make the filling for these Gluten Free Stuffed Peppers ahead of time and freeze it. Then, pull it out to stuff your peppers on the day you plan to serve them. •Whether you serve this Slow Cooker Cranberry Pork Roast fresh or freeze it to cook later, add some green beans and dressing and dinner is done! Serve this Slow Cooker Pineapple BBQ Beef on toasted buns for a savory dinner the whole family will enjoy! Assemble these Slow Cooker Curried Pork Chops ahead of time and freeze it for later. Just dump it in the slow cooker on the day you plan to serve it, and your house will smell heavenly as it cooks. I like to keep my freezer stocked with burger patties, and these Parmesan Turkey Burgers offer a nice variety for our busy evenings. These Slow Cooker Apricot BBQ Chicken Wings are easy to make and kid-friendly, too! Gluten-free Honey Bourbon Chicken can be made in the crockpot. 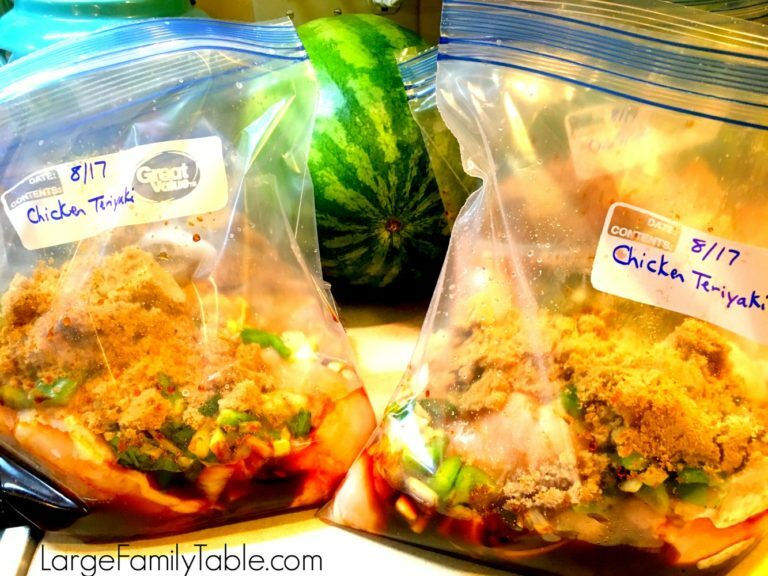 You can prepare it ahead of time and freeze it for a “dump and go” recipe on a busy day. Slow cooker Honey Garlic Chicken is perfect served over rice or quinoa. Be sure to use gluten-free soy sauce for a gluten-free meal. Serve this Chicken Teriyaki meal over rice and add your favorite veggie side dish. This recipe makes four batches to stock your freezer. Oh yum! This gluten-free crockpot Frito Pie is a great time-saver that’s packed with flavor! Freeze the mixture, and toss it in the crockpot on a busy day. Serve it over fresh Frito corn chips for dinner. Make a dozen (or more) of these freezer-friendly, gluten-free breakfast sandwiches to feed your family on your super busy mornings. This Chicken Broccoli Rice Casserole is a great meal to make ahead and put in the freezer. From freezer to table, this Sweet & Spicy Chicken recipe is a healthier, tastier alternative to take out. Easy Mexican Casserole can be made in the skillet or the slow cooker. The flavors come together perfectly and will have your family begging for more. Be sure to use gluten-free taco seasoning to keep this meal grain-free. 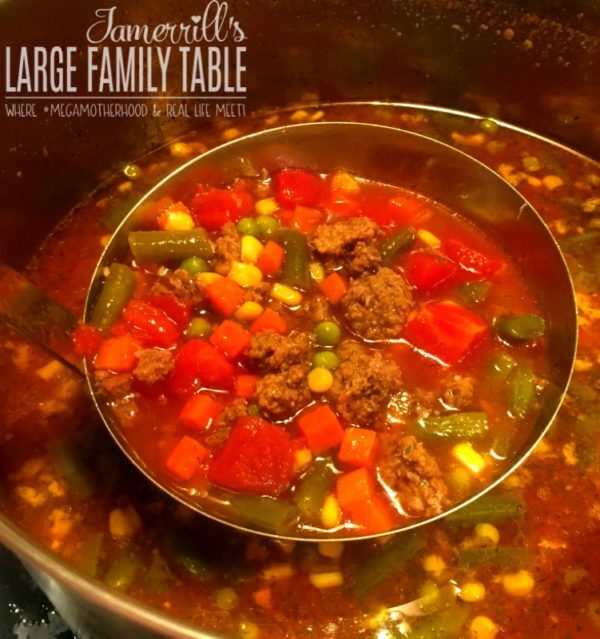 This classic Vegetable Beef Soup is sure to be a winner with your family this winter! Serve it with a salad or alongside grilled cheese to round out the meal. 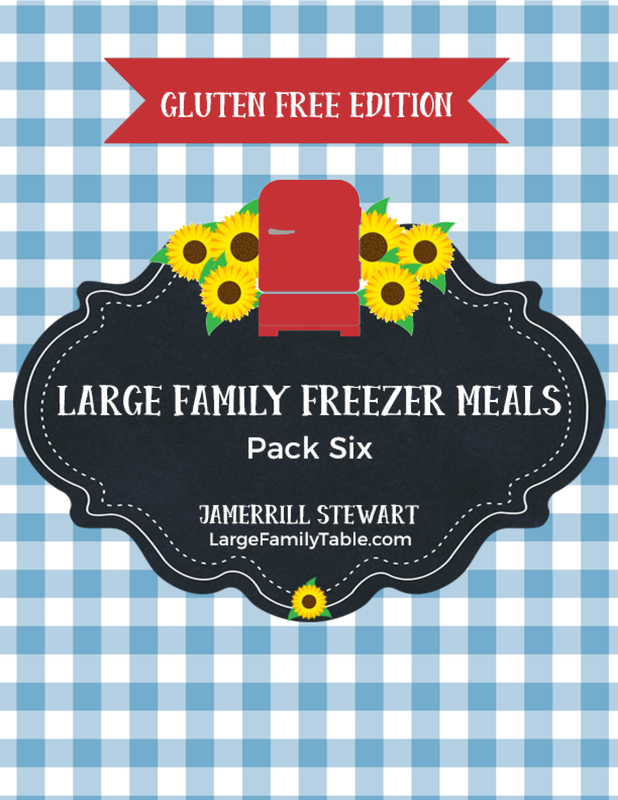 Here’s an inside look at the Large Family Freezer Meals Pack 6 Gluten-Free Edition! Crock Pot Spicy Chicken Soup is sure to heat things up on a chilly winter evening! I’ve never met a kid who didn’t like chicken tenders. These gluten-free Chicken Tenders can be prepared ahead of time and pulled out for a quick lunch or dinner. 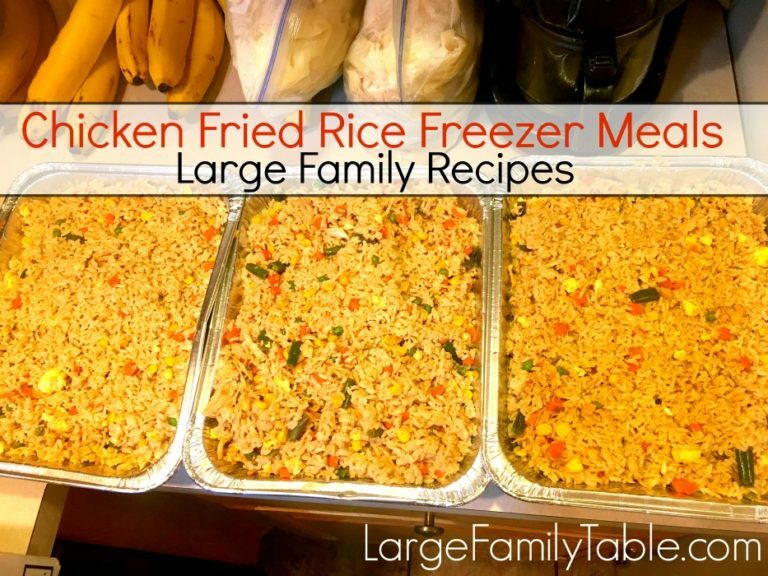 Are you looking for a freezer meal that doesn’t taste like leftovers? You’ve got to try this freezer-to-slow cooker Chicken Chili recipe. This Burrito Pie is my husband’s all-time favorite freezer meal. It makes enough to feed my family of ten with leftovers! You can make this Black Bean & Spinach Enchilada Casserole ahead of time, and then pop it in the oven for a quick and easy dinner. If you use gluten-free taco seasoning, this Mexican Meatloaf is a tasty gluten-free dinner. This meal is easy to adapt to fit your family’s tastes. Slow cooker Fiesta Chicken Soup has an amazing combination of flavors that will fill your house with a lovely aroma as it cooks. Top it with gluten-free tortilla strips for a nice crunch! Crockpot Chicken Fajitas are flavorful, but they aren’t too spicy for the kids. Even the pickiest eater in your family will love them! Break out of your slow cooker chicken rut with this Rosemary Garlic Chicken recipe. If you’re pinched for time, you can cook it in the Instant Pot, as well. This Shepherd’s Pie is topped with sweet potatoes for a nice twist on a classic comfort food. Paleo Pumpkin Spice Pancakes are the perfect for fall and for the holidays. Mix up a double or triple batch to stock your freezer. Freezer to Oven Enchilada Stuffed Sweet Potatoes make a great meatless meal to serve for lunch or dinner. This Chicken Fried Rice recipe will feed a crowd, and it’s easily adaptable. Serve some tonight, and freeze the rest! If you’ve got company coming to visit, this Italian Sausage Frittata would make a great breakfast to serve. Mix it up ahead of time, and pull it out of the freezer in the morning to cook it. Your guests will be so thankful! Is there anything that says “comfort food” more than a hearty beef stew? Try this gluten-free Beef Stew that is sure to be a hit! Here’s yet another fabulous enchilada meal for your family to fall in love with. This Chicken Enchilada Casserole Recipe is stacked instead of rolled making it quick and easy to put together. This Shepherd’s Pie recipe is perfect for stocking the freezer with comfort foods to feed your family on a busy night. And, it makes a bunch so it’ll fill your freezer with a few extra meals, as well. Turn Mexican rice into a full-blown meal with this Mexican Brown Rice Bake. It’s a cheesy chicken dinner the whole family will love! This Bacon Cheeseburger Casserole makes about 12 servings. That’s enough to feed your large family. You could double it to have extra for the freezer, too! Whip up some of these Mini Chicken Pizza Bites for a fun snack or appetizer. Mix them up ahead of time and freeze them for game day! Dinner doesn’t get much easier than this Slow Cooker Chicken Parmesan! You won’t believe how good your house will smell while dinner is cooking. Looking for a good gluten-free alternative for pizza night? Try this Low-Carb Deconstructed Pizza Casserole. Low Carb Chicken Cordon Bleu is an easy, gluten-free dinner recipe. Skip the flour and use Xanthan gum to thicken the sauce for a flavorful meal. While these Mini Italian Meat Loaves may look like cupcakes, they’re actually a savory, delicious dinner idea that your kids will love! If you’re like me and think barbecue sauce makes everything taste better, you’ll love this Large Family BBQ Meatloaf. Sneak in some chopped veggies to beef up the nutritional value of this tasty meal. Stock your freezer with some Gluten-Free Pizza Dough for a homemade pizza night! Chicken Parmesan Pasta Casserole is an easy, gluten-free dish your whole family will talk about. Bake it up, and watch it disappear. Tomato Basil Chicken Stew can be made on the stove or in the slow cooker. The leftovers freeze well for a quick lunch or dinner on another day, as well. I love meals that I can just dump and go! Toss all the ingredients for these Easy Slow Cooker Chicken Fajitas into your slow cooker, and set it and forget it. Ground Turkey Skillet with Green Beans is so simple to prepare, and it freezes well if you choose to prepare it ahead of time. These Gluten-Free Baked Taquitos are perfect for game day or an easy weeknight dinner for your family. Gluten Free Ham and Cheese Quiche can be frozen before or after baking. It’s perfect for brunch, and it’s hearty enough for a quick dinner. Eating gluten-free doesn’t mean you have to skip the pasta! This Slow Cooker Gluten-Free Macaroni and Cheese recipe is perfect as a side or a main dish. This Spicy Chicken Sausage Pasta Recipe is full of flavor and texture with minimal work involved in prepping it. Pineapple adds a flavorful twist to these tacos. Using a liner in your slow cooker means these Pineapple Pulled Pork Tacos are a breeze to clean up. This One Pan Lemon Chicken Recipe has so much flavor, and it doesn’t require a ton of ingredients. One-Pot Burrito Bowls are a great way to use up bits of frozen veggies and meat you’ve got tucked away in the freezer! Simmer these homemade Italian Meatballs in a homemade marinara sauce, then serve over your favorite gluten-free pasta or veggie noodle. Bake up some Fluffy Gluten Free Biscuits to serve alongside your favorite meals. Freeze the leftover baked biscuits, and reheat them in the oven later. With a gluten-free boxed mix, you can whip up a batch of Hearty Chicken Pot Pie in no time. Homemade Hamburger Helper Cheeseburger Macaroni is a meal the whole family will enjoy! This Crockpot Ham Recipe requires just five ingredients! It is ridiculously simple to make! This Crock Pot Brown Sugar Pineapple Ham is perfect for holidays and weekends (or any day really!). Mix up a batch or two of these Slow Cooker Chicken Zucchini Meatballs for a nice change of pace. Whether you’re feeding two or ten, this Instant Pot Paleo Chili is perfect for fall and winter. It’s packed with veggies, and it is freezer-friendly. Gluten-Free Baked Apple Donuts are light and airy, and they’re baked not fried. Mix up a double or triple batch. Eat some today, and freeze the rest for a busy morning. Gluten-Free Pizza Pockets are perfect for a quick and easy lunch or afternoon snack! 5-Ingredient Pesto Chicken Soup is full of flavor despite having few ingredients. This is a great way to use up your leftover pesto or to serve up a new version of chicken soup. It freezes well. This Black Bean and Beef Enchilada Casserole is quick and easy to make, and it makes great leftovers! Mix up some Gluten-Free Pumpkin Bread this fall. You can make some to enjoy this morning, and make a few extras to freeze. If you’re really adventurous in the kitchen, you could try your hand at making Homemade Gluten-Free Ravioli! Mixing up several dozen Gluten Free Peanut Butter Cookies is a much cheaper alternative to buying them in the store. Store them in the freezer, and you can pull out a few at a time to munch on when you need a tasty dessert. 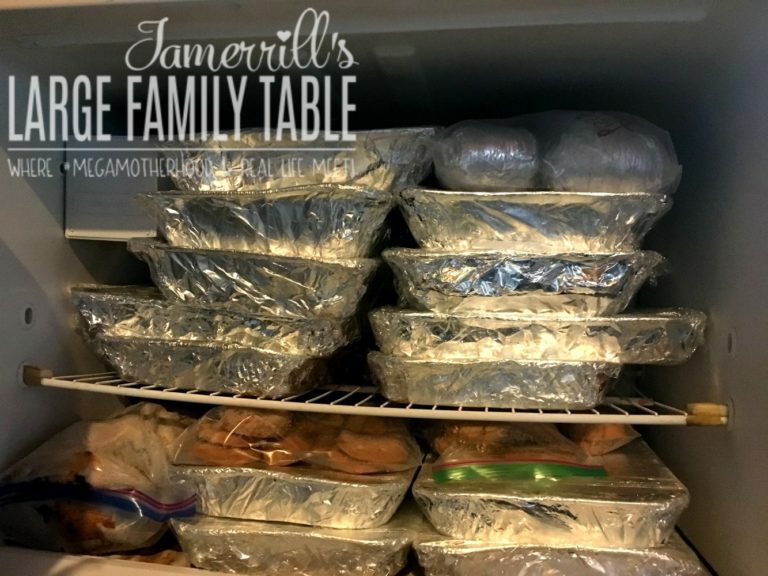 If you love these recipes, be sure to check out 50 Keto Instant Pot Large Family Freezer Meals! 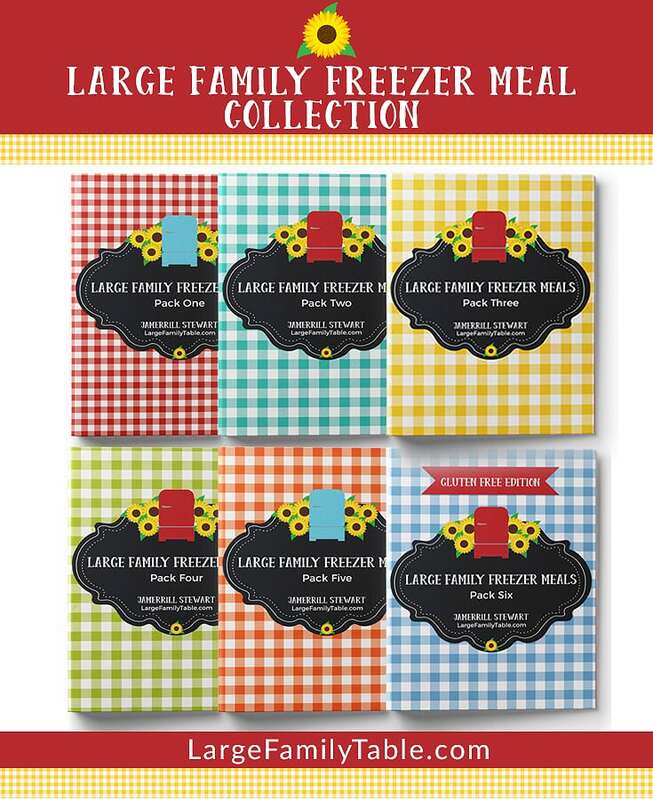 DON’T MISS the new large family freezer meals collection! 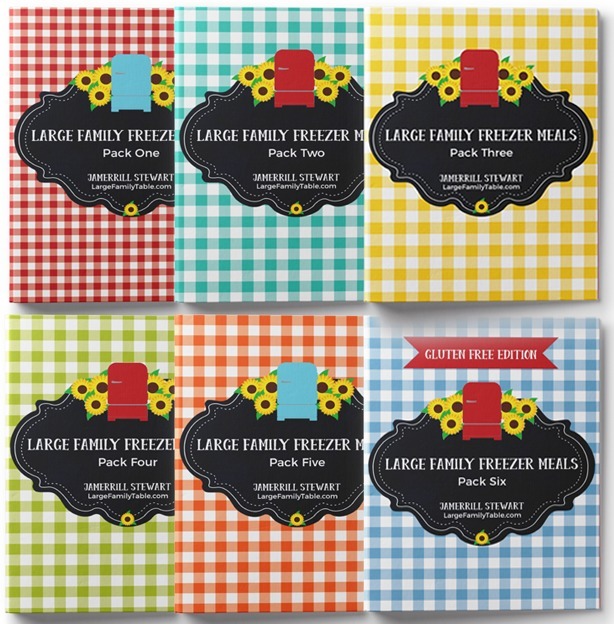 Snag large family freezer meals packs 1, 2, 3, 4, 5, and 6 now!! 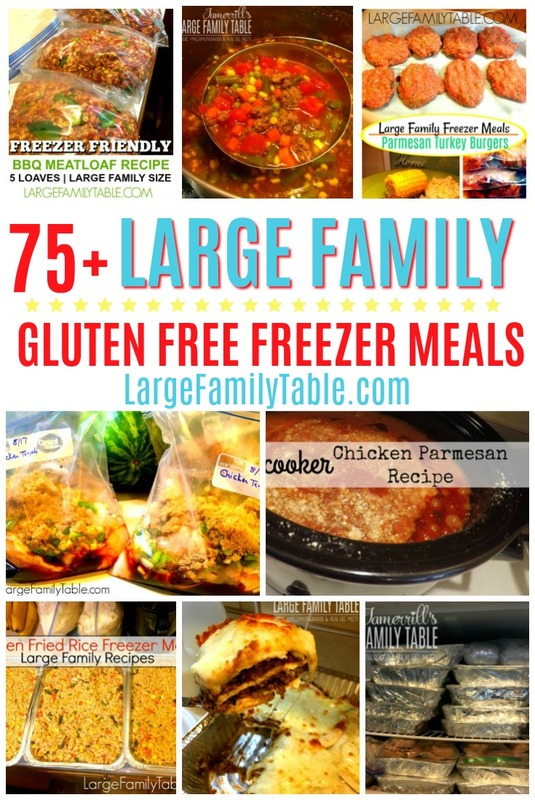 Click here to see the entire Large Family Freezer Meals collection! Thank you so much for these Jamerill. I’ve been so sick. Had a colonscopy, and an endoscopy. Turned out I was gluten intolerant. I am so happy to have new recipes. If you find any new ones, please let us all know. This was so kind of you.